School is upon us again, and we are all faced with the annual task of getting the supplies on our children’s back to school lists. From paper and pencils to entire wardrobes, our main challenge is finding it all at a reasonable price. 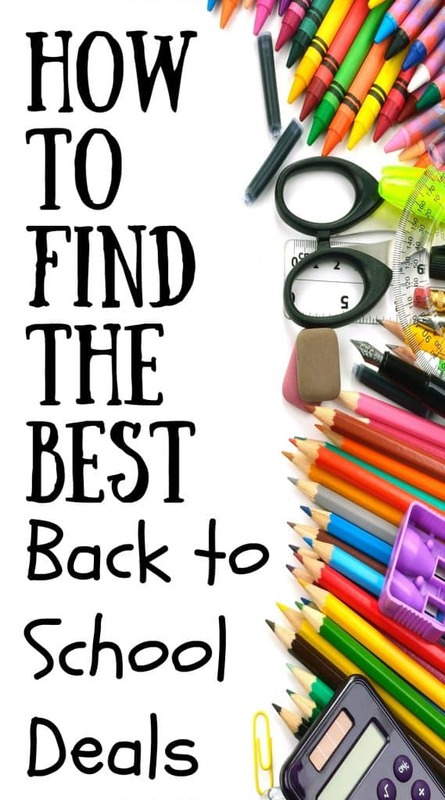 Here are a few ideas to help you get find the best back to school deals with as little money spent as possible. Some people love them and some people hate them, but when it comes to affordable back to school supplies, big box stores, like Walmart, can’t be beat. It’s nice to have a one-stop-shop where you can buy practically everything on your child’s back to school list, or at least to be able to stop there on the way home after you’ve been everywhere else and still have a few items you couldn’t find. Dollar stores used to have cheap products that didn’t always work properly. Now, many dollar stores sell exactly the same merchandise that is sold in other stores, only for less money. Shop around, since dollar stores are similar to other stores in the sense that some are better than others, you may have to go to a few to find the best back to school deals. Used clothing and items no longer have a stigma attached to them. Not to mention, no one needs to know that your child’s adorable jacket or designer shoes were previously loved. Try out this widely-used secret if you want your child’s clothing and items to be one-of-a-kind, and not just something that everyone else will be wearing or using. Apps are a great addition to your child’s back to school purchases, and there are many new ones that can make you and your child’s lives easier. Instead of purchasing a bunch of fancy apps for your child’s smartphone, though, try out the free ones. From homework helpers, to calendars, to fancy calculators, your child’s smartphone can be loaded with the newest and best apps for nothing, or next to nothing. What could be better than not to even have to go to the shopping mall at all? It is now possible to do all your back to school shopping from home. You can purchase everything online – from clothing, to stationery, to school snacks… and even have it delivered right to your door. Be sure to leave enough time so that if something doesn’t fit right or look the way you imagined, you will have time to return, exchange or replace the item before school starts. Online sites such as eBay and Amazon are a great start in your search, and there are many more that carry various items. Back to school shopping doesn’t have to completely drain your wallet. There are many different places to find all the items your child needs. The competition is fierce, and this works in your favor. Get your shopping started now and they will be ready on the first day of school with all your back to school deals, ready to do their job.